Lovin' Lyrics Music Promotions: WANT TO BE KILLIN' TIME WITH CLINT BLACK IN MUSIC CITY? WANT TO BE KILLIN' TIME WITH CLINT BLACK IN MUSIC CITY? Blake Esse of Culpeper, VA - Original Song: "Feels Good Don't It"
Jefferson Clay of Austin, TX - Original song: "San Francisco"
Julie McCloud of Waynesboro, PA - Original song: "My Little Men"
Sasha Aaron of Nashville, TN - Original song: "Red Roses And White Whiskey"
Now it's up to you to decide who will win the opportunity to fly to Nashville and record with country music legend Clint Black. Watch videos of the finalists’ original songs and vote for your favorite at www.chideo.com/clintblack. Voting is free! In addition to voting for your favorite singer-songwriter, there's something you can win too! 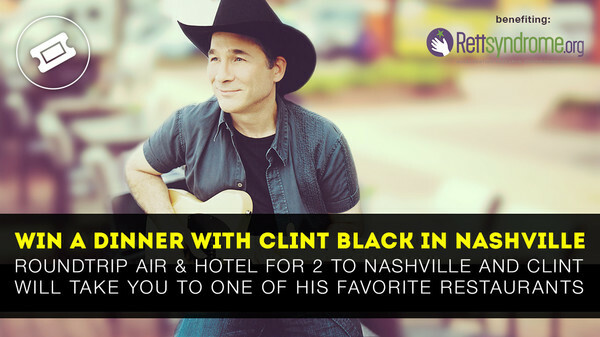 You can enter for a chance to win an exclusive trip to Nashville, Tennessee to have dinner with Clint Black! One lucky winner and a guest will receive round-trip airfare and hotel arrangements to Nashville, Tennessee, where they will dine at one of the country music star's favorite restaurants. To enter, make a donation to benefit Rett Syndrome or vote for your favorite finalist in the Clint Black Dream Recording Session Contest. What are you waiting for? Donate to help with the fight against Rett Syndrome, vote for your favorite songwriting finalist and help them move one step closer to their dream by writing with Clint and possibly win your own night on the town with Clint!